Aside from our (1) over-medicating and "over-intervening" medical culture and our (2) lack of preventative medicine, one of the problems within US medicine today is that the "normal" ranges are based off "normal Americans". ​And normal Americans are having a major health crisis. For example, we are seeing rises in cancer, Alzheimer's, diabetes, allergies, celiac, and even a myriad of mental diseases, while obesity is hovering around one-third of the total population according to the Centers for Disease Control (CDC) [ref]. I believe that this current "unhealth" crisis is tied to both excesses and deficiencies. We are excessively stressed in mind and body. Our bodies are inundated every day with designer chemicals, pervasive sugar, inflammatory proteins from wheat, dairy, and soy, and aflatoxin plus [intestinal-hole-punching] BT toxin from GMO products. These "excesses" are in nearly all of the affordable food choices in the grocery store; excesses we don't want. They leads to formidable toxic burdens even for the lucky few with the "best genes". And exercise can only buffer a limited amount of that crap. You are exercising or at least moving your body every day, yes? Further: our deficiencies are weakening our capacity to fight excess toxic burdens. We "develop" our souls, minds, and bodies in sedentary school classrooms, "advance" to even more sedentary jobs, and then we develop numerous nutrient deficiencies on top of everything. Keep in mind that many nutrient recommendations are based on "subsisting" rather than "optimizing". Coupled together, wading through these - often unavoidable - excesses/deficiencies threatens to push our bodies beyond their healing capacities. I advise prudent decreases or complete avoidance of certain foods and products before recommending supplements. The principle to follow here is this: if it is not found in nature, only ingest artificial products if the payoff is exceedingly positive. ​Doctors often "need" to prescribe medication to avoid malpractice lawsuits that might arise. They err on the safe side; over-medicate. You should err on your own safe side; don't use it unless you need it. With drugs, new adverse side-effects frequently arise in "future" studies, if they don't already exist somewhere in the scientific milieu. Ask yourself: is the payoff exceedingly positive enough to outweigh these present or future side-effects? Sometimes the answer is yes...but that's rare. This principle of "ingesting things only if the payoff is exceedingly positive" should be used with vaccines, prescribed drugs, and even extended to pesticides, herbicides, and other "safe" unnaturally concentrated chemicals. Include plastics, too. Take it from this 2015 medical journal study: "Some chemicals used in consumer products or manufacturing (eg, plastics, pesticides) have estrogenic activities; these xenoestrogens may affect immune responses and have recently emerged as a new risk factors for obesity and cardiovascular disease" (ref). What most people don't realize is that as scientific studies advance, a pattern emerges. Our "certified safe" but unnatural chemicals continue to be "worse than originally thought". Think about the lead-paint or trans fat stories. I literally know of a scientist that was publicly laughed at during lectures for saying "trans fat is harmful" back when trans fat was promoted (and marketed) as "healthy fat". ​Fast-forward and you see researchers publishing findings about epigenetic changes and "transgenerational" decreases in survival and fertility from plastics and the active ingredient in birth-control pills such as EE2 (full paper ref). "Transgenerational" is as bad as it sounds, despite the attempt at euphemism. These health problems are being passed to our kids and even our grandkids. It is becoming increasingly apparent among scientists that various forms of inflammation are at the root cause of numerous diseases. Inflammation is a cell signalling process including nasty molecules like TNF-alpha, interleukins, and interferons, which can be beneficial for protecting a small wound or invaluable during an invasion of bacteria or parasites but destructive when they are let loose throughout your entire circulatory system. Therefore, I strongly urge that you try to diminish or eliminate your constantly buffeting circulatory inflammation. How can you avoid inflammation? You must first know what might cause this negative inflammation. Mass-produced foods, juices, and sodas with high simple sugar content. "Pharmacological dose" high, as I like to say. Literally, "food" or "juice" synthesizers (people fabricating food "components" using technological processing methods, beginning with originally whole foods) are activating the addictive cocaine center of your brain with pure sugars (ref). Constant "cocaine activation" by simple sugar can be incredibly inflammatory leading to a host of health problems including arterial plaque (ref). So simply decrease or eliminate simple sugars. And avoid fructose, especially the high-fructose corn syrup variety. Why? First: "High fructose corn syrup has been shown to contain trace amounts of mercury as a result of some manufacturing processes, and its consumption can also lead to zinc loss" (ref). And there is no such thing as "acceptable amounts of mercury" in your body, in my opinion. Also, when professional scientists - a dry and cautious bunch - include "Fructose as a Weapon of Mass Destruction" in an article title (ref), you might want to be wary of fructose. Fructose rapidly spikes insulin, which alone can be inflammatory (ref) and fructose also activates liver fat storage (ref). Other devious chemicals that spike insulin are artificial sweeteners. Just for the harm they cause to our gut bacteria (ref), they should be avoided. In addition, I've attended scientific lectures at Boston University School of Medicine revealing not-yet-published studies (Barbara A. Corkey, Ph.D.) showing numerous varieties of these artificial sweeteners spike insulin. But the publications are starting to roll in. One published example is Ace K (ref). Also, aspartame, sacharrin, and sucralose (ref) are harmful, with aspartame being the worse due to its breakdown into formaldehyde (ref). Note: formaldehyde is terrible for your health for reasons including its carcinogen ("cancer-causing") classification since 2004 (ref) and its adverse affects in pregnant women (ref). Speaking of formaldehyde, anything that might cause leaky gut (intestinal permeability) should be aggressively avoided, especially if you have a genetically weak intestinal wall. Leaky gut leads to many things including diminished nutrient and vitamin uptake, such as vitamin D (ref). Leaky gut also causes food additives and other toxins (ref) as well as whole proteins (ref) readily entering your bloodstream. Food proteins should not be leaking into your bloodstream as large fragments or as whole proteins. These proteins often cause (1) your immune system to react against them as it might react against an invading bacteria (inflammation!) and (2) they may cause food addictions through opioid receptor binding in the brain (similar to morphine, heroin, etc. ), seen especially with gluten, soy, and casein protein in milk (butter and pure creams do not need to be avoided, since they contain almost no protein [unless you have a severe allergy to trace amounts of casein or other milk components]). In any case, I recommend an elimination-type diet, like The Virgin Diet (J.J. Virgin), for a two month test if you haven't yet tried this. Wheat and other grains are especially likely to be dragging you down as you age, in the same way a hangover might affect you more as you age. When a person is 20, overdosing alcohol is extremely toxic just as it is when a person is 40, but a younger body will clear the toxicity much faster. And these things that are toxic to adults are certainly toxic to children too; it may simply be less obvious due to faster recovery time in children. It goes without saying but be especially vigilant for children; corporate America (including government) can't be trusted or totally relied upon for these responsibilities. Subsidiarity works. In addition to (1) the increase in chemical pesticide/herbicide use with many "resistant" crops (ref), (2) the modern increase in gluten within wheat compared to ancient strains like Emmer, Einkorn, and Kamut, (3) the virtually undigested gluten passing through your oral, gastric, and duodenal digestive system (unless you add specific enzymes, ref), we ALSO have the burdens of (4) aflatoxin and (5) GMO grains, to ensure your body is pushed past our natural limits. Like mercury, there is no level of aflatoxin that is "acceptable". Aflatoxin is a fungi-secreted small molecule that is extremely mutagenic and carcinogenic, meaning "cancer-causing". (Aflatoxin instigates a p53 mutation, making it one of the most carcinogenic substances known to scientists today [full paper ref]). And aflatoxin is commonly found within mass-stored foods (check out this study where scientists are adding bacteria to peanuts to try to kill the aflatoxin-producing fungus [full paper ref]), especially in large-scale commercial grain storage. Similarly, bacterial toxin bacillus thuringiensis, or BT toxin, is rampant within our foods [GMO]. Besides causing harm to monarch butterfly populations (ref), BT toxin causes pores (holes) to be punched into insect digestive tracts, saving our grains from their greedy appetites (because they're now dead). Not to sound conspiratorial, but BT toxin "must" be safe for humans since food companies and politicians are currently teaming-up to ensure that it is illegal to label foods that contain GMO (Google it). Besides, there is this FDA statement: "Based on EPA's finding that the genetically engineered proteins in BT 10 are safe [...] the FDA has concluded that the presence of BT 10 corn in the food and feed supply poses no safety concerns" (ref). Then, if you actually read the EPA statement on BT toxin that is referred to by the FDA (ref), the EPA is clearly more concerned about the monarch butterfly population than the human beings and they don't even reference any human studies (which are admittedly sparse, pro or con). Besides vigilant avoidance's, what else can you do? Multivitamins: A Waste Of Money? I frequently see articles about multivitamins that claim "no health benefits" [ref], even though certain benefits are found when I read the original sources. Simply put, the problem with taking multivitamins is that they are usually not specific enough to your situation. For example, children need high levels of calcium but adults in developed countries are likely overdosing calcium, leading to calcified arteries (ref) and upward trends in cardiovascular disease (ref). So, in the very least, adults versus children should be approached differently. I personally take a variety of personalized vitamins (based on my DNA) and, even more importantly, I administer Kids Natural Calm Multi to my children every day. These choices are an excellent place to start. The liquids are absorbed efficiently and the servings are thorough and intelligently designed. I also appreciate the omega-3's and the mineral contents, although I commonly include additional zinc and some other customized additions. Additionally, I recommend taking vitamins together with good fats, like grass-fed butter (below). Remember: We exercise differently with different goals. We have different mutations in our DNA. Our age is different. We have different levels of stress, sleep, diets, hormones, illness, etc. Customize your supplements. Experiment on yourself. What Supplements Does Dr. Jay "Generally" Recommend? My multivitamin recommendation varies but you might find an good multi here. In addition, use something without folic acid if you have the MTHFR mutation like I do (read about it on the Mutation Key page). Magnesium is chronically deficient in 60% of Americans [full paper ref]. This is a serious problem because this mineral is involved in over 600 enzymatic reactions (including energy metabolism and protein synthesis), functions in the brain, heart, and muscles, has anti-inflammatory properties, and "has been shown to be beneficial in treatment of, among others, preeclampsia, migraine, depression, coronary artery disease, and asthma" [same ref as above]. It is noted in the above review paper: "Part of the problem stems from the soil used for agriculture, which is becoming increasingly deficient in essential minerals." This is unfortunately true of many vitamins and minerals, further exacerbated by our catastrophic destruction of good, healthy bacteria in our high-production farms. So unless you are eating heaps of organic veggies and especially greens, I recommend Natural Vitality Natural Calm Magnesium supplements or something similar. To save money, take only one-half dose or less, since you get some in your diet. Also, take magnesium around bedtime since magnesium often induces drowsiness. In my early 20's, I developed scary heart-palpitations that came and went periodically for more than 6 months. Various medical specialists around Boston detected the palpitations but were stumped since they found nothing wrong in their tests. Around this time, I found out about how deficient the US soil is in magnesium and started taking Natural Calm magnesium. My palpitations evaporated. I have never had palpitations since (except one time for a few days when I took methyl-folate for the first time) and I've since studied the connection between magnesium deficiency and heart problems (ref). Just realize that magnesium oxide may not be sufficiently absorbed, if you choose to take the commonly-found oxide form (ref). I highly recommended DHA/EPA provided these are from good quality sources (find the best DHA among the 51 tested here), and especially for young children and infants, at proper doses. Why? DHA is a major structural component of brain tissue, comprising 30% of mammalian gray matter neuronal membranes [full paper ref]. Not surprisingly then, DHA contributes to synaptic function and neurotransmission and it also has antioxidant and anti-inflammatory properties [same ref as above]. Especially your children need proper brain "architecture". DHA may help significantly, especially since "human brains accumulate DHA up to age 18, most aggressively from about half-way through gestation to about two years of age" [ref]. DPA and other omega-3 fatty acids may also be excellent but the research here is still waking up every few hours and night and crying. Grass-Fed Butter is among my top 5 recommended supplements, especially because modern culture has demonized fats to the point where most people are lacking good fats. Read further about "good fats" and oxidizing fats on this page of our site. Of course, be sure to keep your inflammation low since inflammation can initiate artery injuries which cholesterol might then need to repair [ref]. But, assuming that your inflammation levels are healthy and under control, cholesterol is excellent in promoting good hormone production because many hormones are derived from cholesterol. Realize that your body can make cholesterol from fat, since it is so vital, but it requires over 20 steps, so your body prefers not to expend that kind of energy. Unless you eat good amounts of cholesterol, at the very least, you likely will not have optimal levels of hormones like testosterone or estrogen, in which case you are 'deficient' in cholesterol, since you'll basically only make the bare minimum. Also, memory function has been shown to improve in people with higher cholesterol [ref], probably because the "dry weight" of our brains are about 10% cholesterol and myelin contains about 2x that amount, depending on age [full paper ref]. Butter also "contains a number of potential anticarcinogenic components including conjugated linoleic acid, sphingomyelin, butyric acid, and ether lipids" [ref]. Just looking at butyric acid you will find that it may "have interesting extraintestinal applications, such as in the treatment of haematological, metabolic, and neurological pathologies" along with incredible benefits to your gut [full paper ref]. That is just the tip of the iceberg and I didn't even mention the DHA or vitamin K2 in grass-fed butter. I recommend a tablespoon before sleeping and one upon waking if you haven't had butter in a long time. Use ghee if you are sensitive to the tiny amounts of casein protein in butter. Good whey (or collagen) protein is phenomenal [for instance, check out: "Supplemental protein in support of muscle mass and health: advantage whey" in the Journal of Food Science]. This is - of course - assuming you are active​. You are active, right? Also, I don't recommend higher protein if you are above age 40....switch to good fats. As an alternative to protein supplements, you might simply eat a lot of foods high in protein but steak is expensive. You might also use vegetarian protein, which can be excellent. I personally prefer hemp protein (I've tried hemp, alfalfa, gemma pea but I'm no expert in vegetarian protein varieties; just don't get soy!). I especially recommend protein along with lifting "heavy" weights – or weights that challenge your body – like a 5 sets of 5 repetitions program (like Medhi's free report; yes, even for women) almost exclusively using the big 6 compound movements: (1) deadlift, (2) squat, (3) bench press, (4) row, (5) pullup (or cable-pulldown), and (6) overhead press. This assumes you are learning proper form on these moves (start with true experts searching around youtube, like Omar Isuf). But why more protein (again: I'm assuming you are lifting heavy, running, being active)? Here's a quote from a recent scientific review: "Dietary Guidelines for protein stems from current perceptions that protein intakes above minimum requirements have no benefit and may pose long-term health risks. These beliefs are largely based on assumptions and extrapolations with little foundation in nutrition science. Diets with increased protein have now been shown to improve adult health with benefits for treatment or prevention of obesity, osteoporosis, type 2 diabetes, Metabolic Syndrome, heart disease, and sarcopenia" [full paper ref]. Protein supplementation even attenuates post-fracture bone loss [ref]. Based on these studies, I personally recommendation you at least double the US protein daily recommend intake values of 56 grams per day for men and 46 grams for women (unless you have a condition, like kidney disease). The US guidelines were developed using sedentary individuals ('merica) and I assume you are exercising at least a little. First, whey is not soy. Stay away from soy ("the most common foods causing food protein-induced enterocolitis syndrome are milk and soy" [ref]). Next, whey normally has no (or almost no) casein protein from cow milk. Casein is used in manufacturing glues, paints, and plastics and I'm not a casein fan (sorry 5lb casein tub sellers). If glue isn't off-putting enough, casein is often inflammatory same as gluten [ref & further: casein is injected into rats in this study to induce inflammation!]. Finally, casein is an exorphin - also similar to gluten - meaning that it can bind the opioid receptors in your brain similar to heroin [ref <- this study using gluten, casein and soy to study brain behavior and implications for schizophrenia]. Finally, whey is cost-effective. Just don't go too cheap; some bargain-basement whey has been found to contain heavy metals. Also, some have more sucralose sweeter than actual protein! We recommend just staying away from artificially sweetened whey and choosing the best from this scientifically tested list. As stated above, one of the problems with US medicine is that the "normal" ranges are based off "normal Americans". And like the current protein daily % value recommendation, this poses a problem for vitamin D3 dosage. In most clinics around the US, if your blood test says you have 31 to 49 ng/ml of vitamin D in your bloodstream, you are told your vitamin D level is "normal" since the numbers have been derived from average Americans (who, in general, sit indoors most of every day). However, a bunch of scientific tests of various native tribes show people with vitamin D levels normally between 50 - 70 ng/ml with one pregnant woman even having a vitamin D level of 105 ng/ml (ref). The best studies recommend staying below 100 ng/ml, but going below 50 ng/ml is not optimal. For instance, I've been to lectures by Michael F. Holick, M.D./Ph.D. at the Boston University School of Medicine, who is the go-to man spearheading efforts to establish better vitamin D recommended doses. 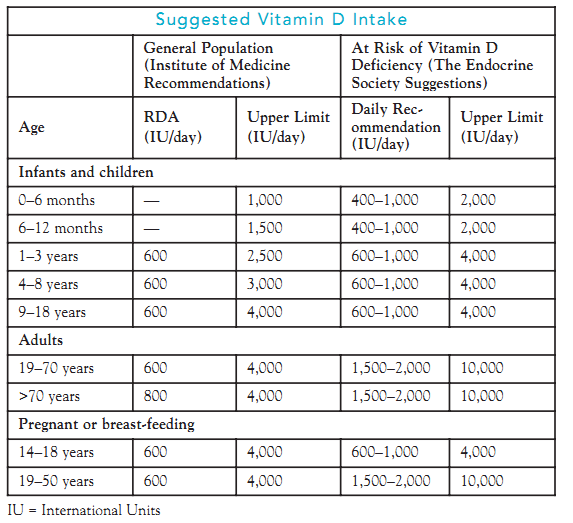 Dr. Holick's paper here ref established the Endocrine Society vitamin D recommendations that I personally utilize (shown in the image on the right from ref), although ideally you use blood tests with your doctor and try to achieve 60-70 ng/ml using whatever "IU" dose that works for you to accomplish this (test in the wintertime so sun expsosure doesn't cause constant variability). Or, if you, like the tribesman above, are out in the sun all day in a thong, you shouldn't need any work here. For the rest of us, vitamin D3 is critical. Dr. Holick, who professionally consults for zoo's around the US, has found that the rampant infertility supposedly due to "animals that don't do well in captivity" is surprisingly often simply infertility from vitamin D deficiency. He says when you dose these animals (panda bears, komodo dragons, etc.) with D, they "magically" become fertile. This occurs because the glass enclosures are blocking certain rays from the sun. And yet, many of us live behind bricks and wood under ceiling lights. Among other things, lack of vitamin D can accelerate cognitive decline including dementia (ref), correlates to depression (ref) and cardiovascular diseases (ref). In addition, vitamin D has numerous roles in bone and muscle developments (ref) and new benefits will undoubtedly continue to come, since it is easier to discover problems from deficiencies than it is to discover benefits from proper doses. How often do you go to the clinic when you feel great? First, I recommend trying iodine and green tea. Unless you are eating seafood everyday, you are probably slightly or grossly deficient in iodine. You may think you are "good" because you use processed "iodized salt", which I do not recommend because added 'anti-caking agents' often contain aluminum which is toxic in the brain [ref]. Yet, over half of US companies producing "iodized salt" don't even contain enough iodine sufficient for optimal health [ref], so you're still probably slightly or grossly deficient in iodine. In fact, a study showed that almost 75% of normal adults no longer consume enough iodine (ref). An iodine deficit can diminish thyroid function (a major energy and weight gain regulator [ref]). In addition, deficiency may cause your thyroid to begin using other similar halogen elements in place of iodine, especially fluoride (ref). Try seaweed pills for awhile and see if your energy levels change. Green Tea has many excellent and gentle "mind-elevating" compounds, including theobromine (Greek for "food of the gods" - also highly expressed in cocoa beans), theophylline, and L-theanine. Green tea is almost certainly extremely 'detoxifying' as well, especially my personal favorite variety, organic Gyokuro Yamashiro, which tastes interesting and has exorbitant levels of chlorophyll since it is grown in the shade for 6-7 weeks before picking. So, even though I find coffee has superior taste (I even roast my own beans and have an espresso maker), I usually drink green tea 9 out of 10 mornings in place of coffee. Specific circumstances often call for specific supplements. Here is a broad list in an attempt to affect the greatest numbers of people. It is not meant to be exhaustive or cover every situation. Important supplements for specific circumstances include creatine, charcoal, good probiotics / prebiotics, vitamin K2, choline, MCT oil, and nicotine. Yes. I said nicotine. Creatine is a natural compound that decreases as we age (ref). It is often used for enhancing muscle performance but also for enhancing brain peroformance. Creatine has been found to have antioxidant properties, reduce mental fatigue, protect the brain from neurotoxicity, and improve facets/components of neurological disorders like depression and bipolar disorder [full paper ref]. Open this page to help you choose a good brand. You might consider activated charcoal if you are fasting (I recommend a 3 day fast once per year for most people; consult your doctor), detoxing, had a recent vaccine, or if you recently ate burnt food (ref). Activated charcoal will help pull toxins from your gut but it can also decrease your nutrient absorption, so take with caution and not regularly, Similarly, increased frequency of sauna "bathing" is associated with a "reduced risk of all-cause mortality" (ref) and you can enjoy sauna time or work outdoors in extremely hot weather (drink lots of water!) on a more regular basis. Find and take good probiotics (see here) once in awhile; "good' being difficult to determine amidst all the useless/bad probiotics flooding the market. I especially recommend good prebiotics to nourish and promote the best gut bacteria, especially if you are prone to anxiety and depression as explained in this full paper ref (I recommend simply using "galactooligosaccharide" prebiotics such as these ones that I personally buy). I also recommend extra vitamin K2 once a week or so, depending on how much butter and meat you eat (these have K2), to help inhibit calcium from depositing in your arteries and hardening your arteries [ref]. Oh, and to help prevent osteoporosis [ref] if you are at risk. Next, choline is clearly important in your brain since it is a precursor of the neurotransmitter acetylcholine. Studies in rodents have shown that high choline intake during gestation improves cognitive function into adulthood and prevents memory decline associated with old age [ref]. Eggs are an excellent source of choline, so dispense with the pills if you eat eggs every morning. Choline is also actively involved in epigenetics [ref] but societies with abundant or overabundant food shouldn't need daily choline supplementing; it just might further optimize you or your children's brains. MCT Oil or, better yet (but very expensive), 100% caprylic acid, is worth examining. Caprylic acid is 8 carbon-long fatty acid and MCT oil is usually 70-80% caprylic acid. Caprylic is a "good fat". Dose recommendations widely vary, so you may simply want to experiment. What is MCT oil all about? When you eat most oils and fats, they mainly contain fatty acids with 16 or 18 carbon-long chains. These common 16 and 18 fatty acids can be burned as energy or stored as fat - your body might easily go either way. This is discussed in depth in "Good Fats". Small fatty acids (technically called "medium chain fatty acids") that have 8 or 12 carbon-long chains, however, are virtually never stored as fat. Your body is capable of making an 8 or 12 carbon fatty acid into a 16 or 18 carbon fatty acid, burning energy in the process (this happens to about 10% of 8-carbon fatty acid in limited situations [ref]), but the vast majority of these smaller fatty acids are burned as energy. In other words, you are "energizing" when you take MCT. But it gets better. Under normal circumstances, if you eat sugar, fat, and protein, your brain will burn the sugar (glucose) as fuel (ref). It can utilize many fuel sources but glucose is the preferred source. However, if you are fasting or on a ketogenic diet (i.e. perceived by your body as "starving") your body burns fat, causing the formation of ketone bodies (shown in the picture), which your brain can and will burn as fuel. In fact, when your brain is powered by ketone bodies, it becomes more focused and people will often experience heightened brain activity while fasting (ref). This makes sense because your brain is fooled into thinking that you need to find food immediately. Caprylic acid in MCT oil can cause this heightened brain activity without the fasting or ketogenic diet (not quite at the same level but certainly easier), since these 8 carbon fatty acids are being burned as fuel and becoming ketone bodies. This may also be why ketones are administered as medicine for patients with "neurodegenerative conditions, epilepsy, hypoxia/ischemia, and traumatic brain injury" (ref). This also ties into the "Type 3 Diabetes" hypothesis of Alzheimer's disease (reviewed here with the conclusion that "Altogether, the results from these studies provide strong evidence in support of the hypothesis that Alzheimer's disease represents a form of diabetes mellitus that selectively afflicts the brain" [ref]). Speaking of neurodegenerative diseases such as Alzheimer's disease, in rare specific situations, I actually recommend nicotine. Notice I didn't say cigarettes. I am in line with the "medical establishment" at least in regards to not recommending smoking. Cigarettes are full of pesticides and other chemicals. Patches or gum, however, have a time and place. "Nicotine," it has been shown, "plays a neuroprotective role in inflammation-mediated central nervous diseases" (ref). This study especially highlights Alzheimer's disease. I have seen numerous similar studies. I believe that the "brain protective" roles that nicotine plays are even more vast than we realize, since not a lot of research money is being sent out to illustrate the benefits of nicotine. On the other hand, another paper notes: "Cigarette smoking has been linked with both increased and decreased risk for Alzheimer's disease" especially emphasizing how the harms of smoking due, in part, to oxidative damage (presumably from smoke) (ref). This paper, however, lumps smokers together with people that have long-quit smoking, which likely skews the numbers. Further, keep in mind that smoking is associated with a +10 year reduction in life expectancy (ref) so by no means should you start smoking (cigarettes) to become healthy. In a review of the long list of failed Parkinson's disease drugs and potential new ones, nicotine is also being highlighted as a potential "disease-modifying therapy" being investigated via full clinical trials. The newest report states "Epidemiological studies identified tobacco smoking to be associated with decreased risk of developing Parkinson's disease" (ref), which isn't shocking, at least to me, considering the body of "neuroprotective" benefits associated with nicotine. In these Parkinson's disease studies, the doctors are using nicotine patches to deliver "therapy", by the way. PS: I do not make any money from any of the above product recommendations. This keeps me free to say whatever I genuinely think based on my experience and research. PPS: Everyone is different. I give some general recommendations here but think it's best to optimize supplements based on DNA variant analysis as well as age, training, and lifestyle.